Usher in the post-government era now. Nations with Traditional economies always have government. 5 a: the organization, machinery, or agency through which a political unit exercises authority and performs functions and which is usually classified according to the distribution of power within it. 5b: the complex of political institutions, laws, and customs through which the function of governing is carried out in a specific political unit. In a Traditional Economy that authority comes from the control of force, that is, if you don’t do what they say they can hurt or kill you. The military and police are the instruments by which this force is organized. These parts of government play their roles in the expectation of being paid for their services. There has never been a government in which the military and police were not paid by the “sovereign authority” whether that authority was an individual (king, despot, ruler) or group (the Roman Senate) or legislative body (the English Parliament). Obviously, the functions of police and the military will be necessary for a Copiosis nation even as it is for Traditional Economy nations. The police and military of a Copiosis nation will have to be paid. They will be paid by the Payer Organization. But does that organization constitute a government? Does it “control and direct”? Does it “exercise authority”? What about the “organization” or “machinery through which a political unit exercises authority and performs functions”? We have already indicated above that those who perform the military and police functions would be paid for doing so but not controlled by those who pay them. The same would also be true for any other actions by individuals which accomplish those functions of government which produce benefits. The criminal justice system (beyond the police), for example, would be paid for their actions if those actions result in Net-Benefit. Judges would be paid based on the consequences of their decisions, not on whether their decisions matched the law. The same is true for all the other roles individuals play in law enforcement. It will no longer matter what the law is since the law is neither an excuse nor a justification for any actions. All that will matter is the consequences of one’s actions. 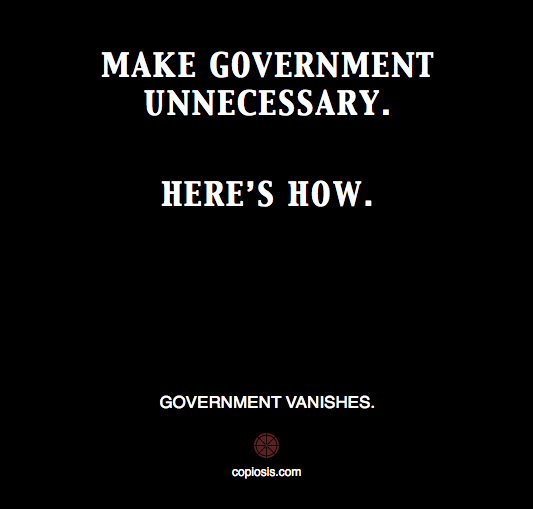 Therefore, the government will have very little to do. There will be no laws to pass concerning human behavior since such laws would not be enforced unless their enforcement brought benefits. But laws would also be unnecessary since if the behavior they require brought benefits then people would already be motivated to act that way. If the behavior they prohibited caused damage, the behavior would already cost those who did these acts money. Plus, others would already be trying to prevent those actions even without the law. The government would have and spend no money at all (and not tax at all) so there would be no appropriations bills. Various Cabinet posts and their entire departments could cease to exist. There might be something for the Secretary of State to do but little for the others. About the only role remaining for government officials would be to represent the nation in relations with the governments of other nations. An important job. But nothing as expansive compared to what we have today. In many respects one might even consider the result “anarchy.” But that term merits definition since it is used in many ways. The definition which fits best for this situation is “absence of government.” There would be no disorder since disorder would cost a lot of people a lot of money. No one gets paid for chaos. Another definition of anarchy is “a utopian society having no government and made up of individuals who enjoy complete freedom.” That comes near the situation except for that word “utopian.” The Copiosis society would by no means be a utopia. There will always be plenty of problems to address and difficulties to overcome. Mother Nature will see to that even if people get along with each other much better. But since a Copiosis society would have almost no government and since the individuals of that society would not be constrained by law or the government, one could say they “enjoyed complete freedom.” Always bearing in mind that behaving irresponsibly would cost those individuals income they might otherwise have gained. My conclusion is that shortly after the adoption of Copiosis, a nation would experience a rapid withering away of that bureaucracy which we are now pleased to call government while at the same time the functions of government would be performed far better and more dependably than ever. The whole idea of a government as a controlling or directing agency will come to seem strange and abhorrent.